This is a magnificent vintage Navajo silver hair pin/ barrett. This museum quality silver hair pin contains a fabulous old Bisbee turquoise stone with surrounding silver leaves, stems and raindrops. Located on the entire pin are intricately hand chiseled silver works. The barrett measures around 4" X 1-3/4" and the legth of the pin that hold the hair in measures around 3-3/4 long. The center stone measures around 5/8" x 1/2". 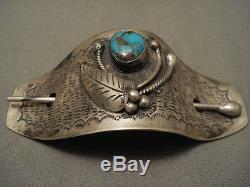 The item "MUSEUM VINTAGE NAVAJO BISBEE TURQUOISE SILVER HAIR PIN BARRETTE" is in sale since Wednesday, November 16, 2016. This item is in the category "Collectibles\Cultures & Ethnicities\Native American\ US\1800-1934\Jewelry". The seller is "nativo-arts" and is located in New Mexico, USA. This item can be shipped worldwide.